Today you can enhance select areas of any image with extraordinary power and precision. Simple brushing techniques applied precisely can take your image to a whole new level, giving you vastly expanded possibilities for creative expression. These essential go-to techniques will help you master selections and masks; simple masks, gradient masks, luminance masks, contour masks and more. Plus, learn to control the position and quality of every transition and edge. 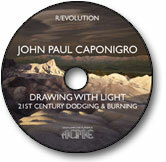 In addition, you’ll discover r/evolutionary new ways of capturing and enhancing light. Drawing With Light; 21st Century Dodging and Burning will teach you these invaluable techniques. With added bonus material that will help you make masks even more efficiently and precisely.